Much urban architecture is framed in terms of solid and void: how to maintain the semblance of a historic city in the face of the automobile, regardless of shifting patterns of growth and inhabitation. This project for a new public garden and performance venue sees the voids opened up in the city by the planning decisions of the 1960s as an opportunity both for public space and for a new form of East-coast urbanism: the urbanism of the extended boundary. 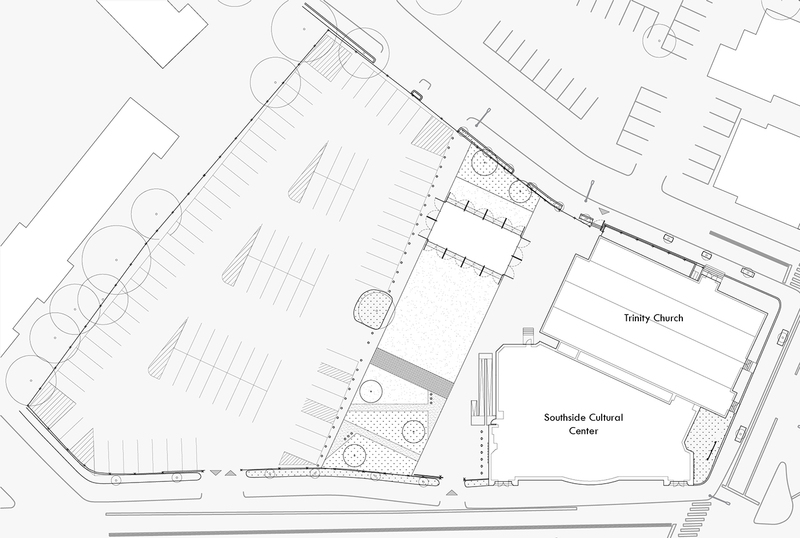 A new public space is conceived as a green band cutting through the vast asphalt parking lot behind an existing cultural center, which as part of recent zoning changes has sharply reduced parking requirements. The strip serves as a soft boundary between the parking lot, the surrounding city, and the existing cultural center, reconnecting adjacent streets and marking the lot as an integral piece of the public realm. The large lawn serves as a generous gathering space bookended by native perennials at either end. The centerpiece of the green band is a three-season performance venue that expands the capacity of local performance groups. Built from a modified catalog greenhouse, the performance space serves as an intensification of the landscape and the programming activities of the cultural center. The monumental doors attached at every column form a new order that, when open, extend the pavilion from discrete, minimal object out into the city. Simultaneously, timed lighting elements integrated into pavilion, fence, and landscape, allow the project to serve as a beacon within the neighborhood as it transitions from day into night.